Christmas (second from left) is our adopted girl. We bred her with another white miniature schnauzer and the other three are her 11 months old girls. Christmas had five in the litter (a boy and four girls). The boy and a girl have been adopted by family members. We are not breeders and we are not selling any of the pups. Christmas and her three girls are now with us. They love doing things and playing together. 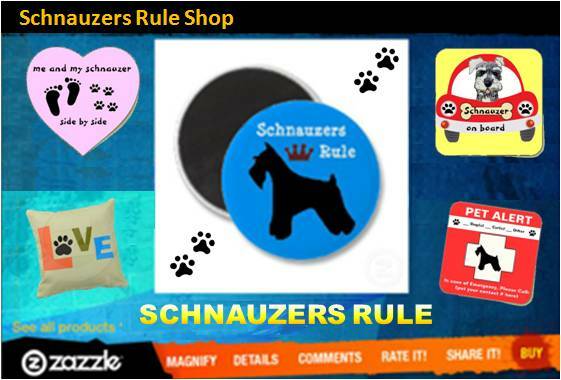 It is great having four miniature schnauzers but at times, I wish I didn't have that many. Taking them out and training them is made harder when there are four! They love playing tug and catch and their favourite toy should be the Kong Wobbler, as it dispenses food! 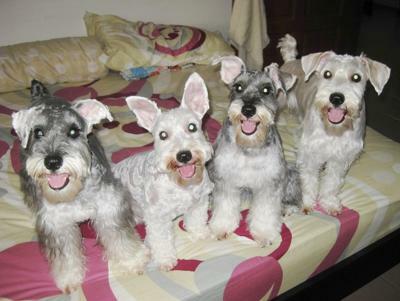 Happy Schnauzers! You can see it in their faces! Your Girls look so Happy! How wonderful to keep the family together! Come visit my girls too. What a wonderful looking group of pets! They do look very well behaved, thanks to all your efforts. Cute, cute, cute!! !